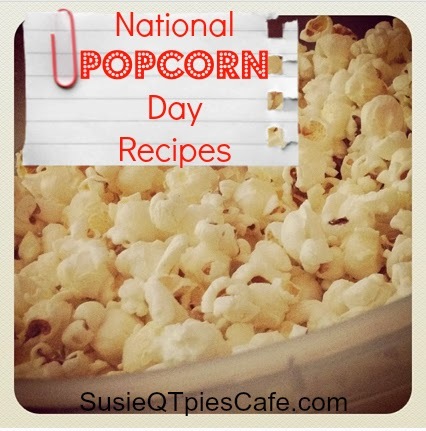 SusieQTpies Cafe: (January 19} Happy National Popcorn Day! (January 19} Happy National Popcorn Day! Popcorn is in the "other food group" for me. I don't eat it as much as I use to but it is my go to snack. I actually prefer it as natural as possible when I eat it at home. I have been knowns to go see a movie JUST TO EAT POPCORN when I'm craving that salty, buttery goodness only served at a movie theater. How do you like your popcorn? Here are some recipes for you to try out. I do cook popcorn several ways. Here are a few of my ideas. Add 1/4 cup of popcorn kernels (I prefer white) into a lunch sack. Fold over 3 times and cook in the microwave on high (or I push the popcorn button) until popping slows down to every 5 or so seconds. Sometimes I'll lightly salt, sprinkle with parmesan cheese or use a seasoning. I have been known to melt 2 tablespoons of butter with 1 teaspoon of oil to add on the popcorn before sprinkling on the seasonings. This goes for the stovetop method, too. Check here for NO MORE NAKED POPCORN. Add 1/2 cup of popcorn kernels to a stovetop pan with 1-2 tbsp of oil. This can be peanut, coconut, olive, canola,etc. whatever you prefer. Place lid on pan with medium heat and let pop. Leave the lid on until done popping. Let pop until popping slows down to every 5 seconds or so. Top as mentioned in the microwave method. 3-Grocery store microwave popcorn. This is rare but occasionally I will purchase this or someone will give them to me.